FITNESS REALITY. Real People. Real Results. Enjoy your workout with Fitness Reality 1000 Plus Rower without leaving your home! The FITNESS REALITY 1000 PLUS has a large 3.5” LCD display, 14 levels of magnetic resistance, and a large cushioned seat will keep you comfortable throughout your workout sessions. In addition, front stabilizer foot pads allows for additional exercises such as curls, bent over rows, front raises, and more. 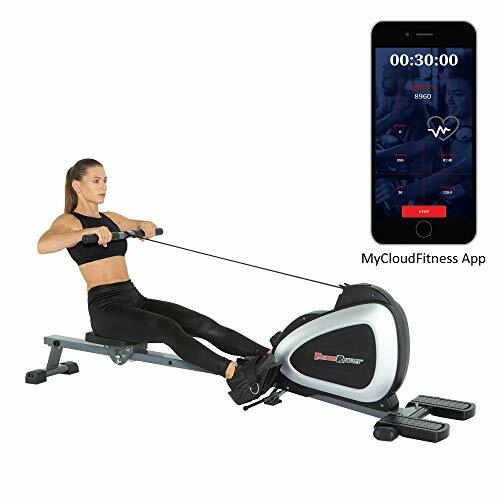 With the free MyCloudFitness app you have the ability to set workout goals, track your workouts, and more. So train hard and get the results you want with the FITNESS REALITY 1000 PLUS Bluetooth Magnetic Rower. [FULL BODY WORKOUT]: The ONLY ROWER WITH ADDITIONAL EXERCISES on the market. Full body low impact workout targets forearms, biceps, triceps, shoulders, legs, thighs and more with additional exercises. Slide rail length/inseam: 39"